Released: CodeIt.Right version 1.8.09300 – now compatible with VS2010 Beta 2! Today we are releasing new version of CodeIt.Right – build 1.8.09300. 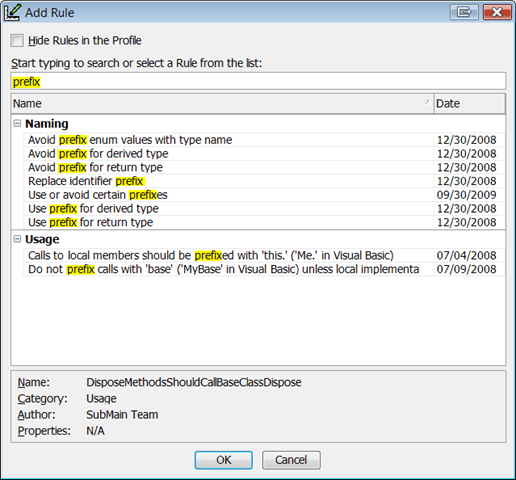 This version features complete ASP.NET support, it is compatible with VS2010 Beta 2 (in addition to VS2008, VS2005, VS2003), Add Rule dialog improvements – “Hide Rules in the Profile” and “Quick Search”, 10+ new rules including new category “CodingStyle”. Those of you who are using CodeIt.Right with very large solutions may know of the memory limitation issue for the tools that live in the Visual Studio address space, aka “Out of Memory” exceptions. You will be excited to know we have addressed the issue in this version by introducing new “Memory Optimization” mode. The “Performance mode” is still on by default since it offers a little faster analysis but CodeIt.Right will offer to switch to the “Memory Optimization” option when you open a large solution or get the dreaded “Out of Memory” exception. You also are free to switch between the options manually. Another change we made – we removed Sealed modifier for all built-in rules. This gives you even easier way to extend and customize existing rules by simply overriding just the methods you wanted changed. See Tutorial: Extending Existing Rules for a sample. Finally complete ASP.NET support including refactorings in HTML markup. Added Memory Optimization mode – allows to minimize the memory use at slightly lower reduces performance. This allows to solve the “Out of Memory” issue on large solutions. Added Performance tab to the Options window – Best Performance/Memory Optimization. Added new “Add” button in Exclude Rule, Exclude File and Exclude Project tabs – the dialogs support multi-select. Profile Editor -> Add Rule dialog has new option Hide Rules in the Profile which removes from the selection the rules that already exist in the selected profile. Added RuleID to rule help documentation. Product license codes when entered are now activated on the SubMain server. Auto Update wizard now shows Software Assurance & Gold Support subscription expiration date. About window now shows Software Assurance & Gold Support subscription expiration date. All web services – Auto Update, Error Reporting, Statistics and Activation – are now accessed over SSL protected HTTPS connection. Removed Sealed modifier for all built-in rules. This allows for new easier way to extend and customize existing rules by simply overriding specific methods. See Tutorial: Extending Existing Rules for a sample. Addressed issues related to incorrect source file encoding when Byte Order Mark (BOM) attribute was missing.